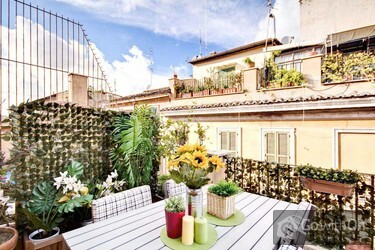 This beautiful 70 m2 apartment can comfortably sleep up to 6 people and is located on the third floor (without a lift) of a palatial period building in the characteristic district of Trastevere. The area has typically been a multicultural hub and is the perfect example of one of Romes most complete offers of shops, art, history and food and drink venues with the greatest offer of cuisine delicacies. 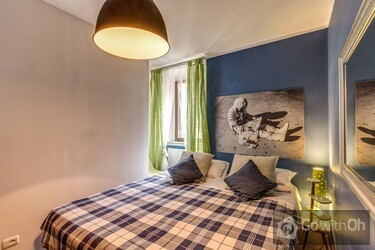 A privileged location means that visitors can comfortably walk into the historical city centre and the district of Trastevere is well connected by a wide range of different bus lines to reach any part of the city quickly and easily. 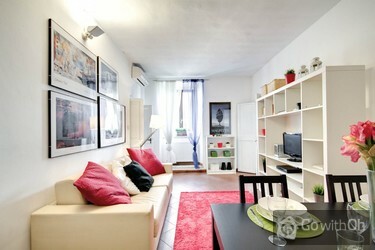 The apartment was reformed in 2011. The ceramic paving along with modern decoration makes the spot both romantic and very cozy. The different shades and decorative features have been carefully chosen to create a very special atmosphere. The main entrance opens onto a large lounge with comfortable double sofa bed, LCD television, a table and chairs. The modern kitchen has been tastefully fitted and is well equipped with everything guests might need during their stay; the kitchen leads onto a beautiful terrace furnished with table and chairs for enjoying mealtimes in the sunshine or some time to unwind. 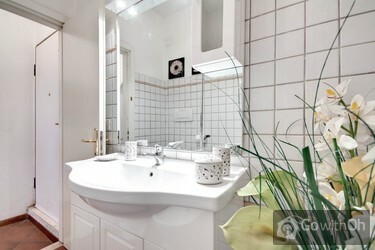 The bathroom has elegant finishing and is fitted with a practical shower cabin. There is also air conditioning and WIFI internet connection available. From 3 pm to 9 pm. Form 00 pm to 6 am, extra charge of 60. Cot available free of charge if requested at the time of making the reservation. If requested upon arrival there will be an additional cost of 10 per day. Please advise the owner in advance of the beds which you wish to use. Without prior notice you may be required to pay a supplement of 10 for bedding. 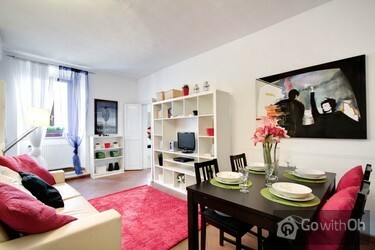 We were very happy with the apartment, is was very clean and even nicer than expected! Exactly as in the description! 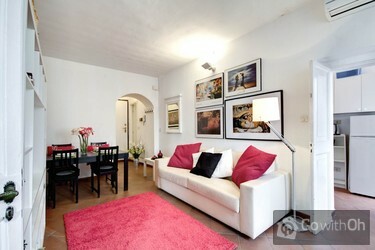 Also liked the location very much and the check-in went very smoothly, no problems at all! We enjoyed it, it was very good. 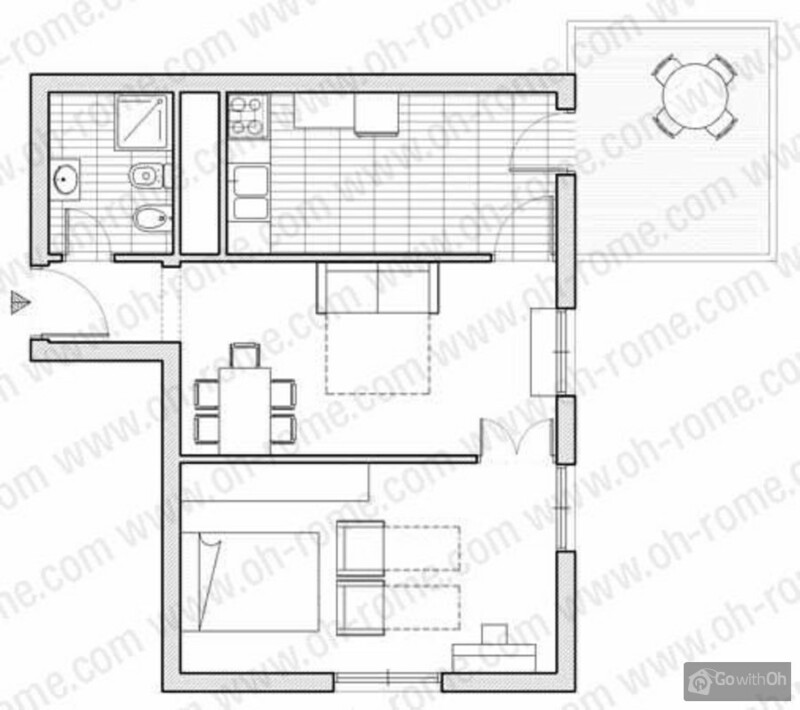 I would use Oh-Rome again for my next stay. Nous étions ravis, tout s'est bien passé, l'appartement correspondait à ce que nous imaginions, nous avons été très bien accueilli par la personne de contact, qui était très agréable. Elle ne parlait pas français et nous ne parlions pas italien mais nous avons réussi à nous comprendre en anglais! Le quartier était très bien. L'accueil a été parfait avec beaucoup de promesses en cas de problème, le lavabo était bouché dès notre arrivée malgré nos appels et e-mails personne n'a répondu, et au départ personne n'était la pour l'état des lieux de sortie et la remise des clès, nous les avons laissé dans ...l'appartement, le quartier est un peu bruyant, mais nous étions en vacances, malgré ceci nous avons passé un excellent séjour beau temps et appartement sympathique. Le propriétaire confirme que le blocage des toilettes a été réparé. Nous voudrions aussi informer nos clients que les check-ins et check-outs doivent être accordés avec la personne de contacte avant le début du séjour . Fijn ruim apartement op een goede locatie, met een heerlijk terras. Die Lage der Wohnung ist super. Zu vielen Sehenswürdigkeiten sind die Wege kurz. 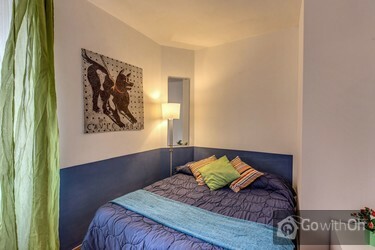 Das sehr lebendigeStadtviertel Trastevere ist auch sehr atraktiv. Einkaufsmöglichkeiten, sowie Restaurants oder Bars sind um die Ecke. We had a fantastic stay at this apartment. We opted for airport transfers which the host offered to arrange for us both ways. They were also very kind to allow us to check in early and check out late too. The location was perfect, away from the hustle and bustle of the city and away from tourist... traps which meant we felt very immersed in Romes culture. Only down point was a bit of a dodgy shower, but we'd definitely revisit! 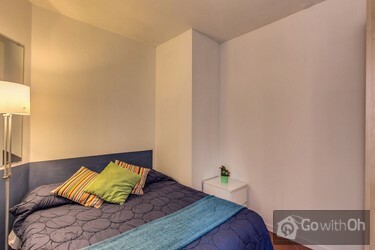 Nous avons passé une semaine formidable dans cet appartement. Sa situation est idéale dans Rome, tous les lieux à visiter sont accessible à pied. 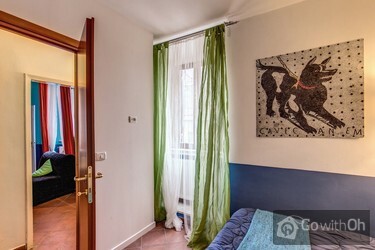 L'appartement en lui même est agréablement décorée. 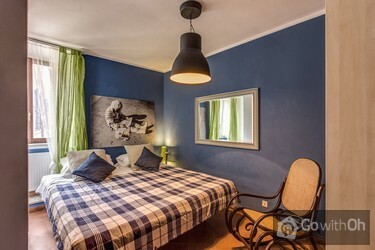 La chambre avec le piano et le rocking chair a un petit coté romantique. Les deux ...téléviseurs bénéficient d'un bouquet de chaines par satellite (mais aucune en français). La connexion wifi était performante. 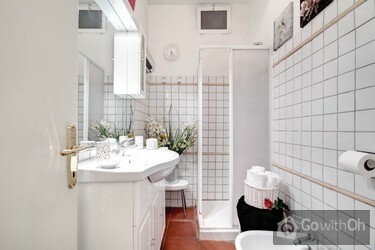 La cuisine et la salle de bain sont petites mais fonctionnelles. La terrasse est un vrai plus appréciable avec vue sur les toits de Rome. Le seul bémol c'est le bruit, mais on ne vient pas à Rome et qui plus est dans le quartier du Trastevere pour dormir. Il y a 3 resto et 2 café en bas de l'immeuble dans la rue. Dear Customer, We appreciate and value your feedback. 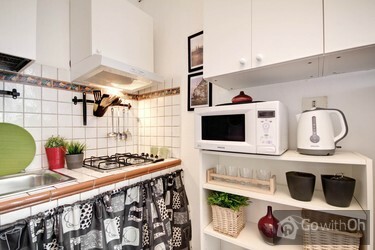 The owner confirms that the apartment doesnt have a washing machine. We regret the error and confirm that we have updated the information on the website. They also informed us that there is a laundromat on the same street as the apartment for guests who need to wash clothes. 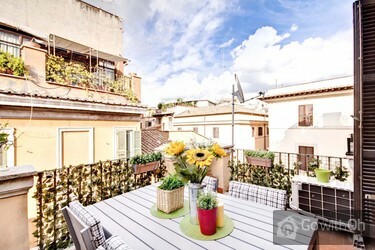 Good beds, nice terrace. 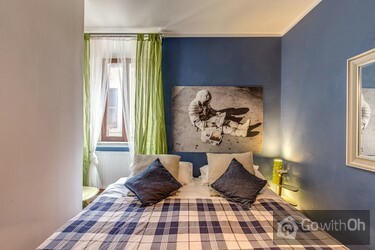 Otherwise: photos no longer represent the apartment: the large corner bedroom (with a piano!) was chopped into a hallway and 2 small dark bedrooms in which one had to move sideways to get out. It is DEFINITELY not romantic and any attractive furniture or colorful touches ...have been removed. Kitchen supplied minimally and several things were broken. Finally, our "welcome" was marginally hostile as we arrived on a holiday and were asked to pay 30 Euro for the privilege (we didn't pay after two telephone calls to the owner.). We had asked the owner to reserve a restaurant for that night, and when we asked him after arrival he said we would have to do it ourselves. We have paid half the price for nicer and friendlier accommodations. 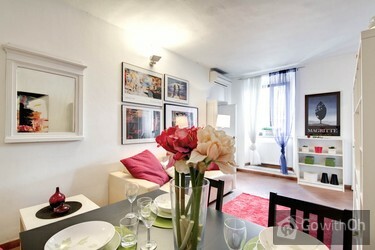 Dear customer, we appreciate and value your feedback which we have passed onto the apartment owner. 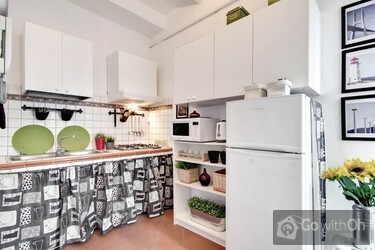 We confirm that we have updated the photos of this apartment on our website by removing the old ones and leaving only those that reflect the current state of the apartment. We are sorry for any inconvenience this may have caused you.